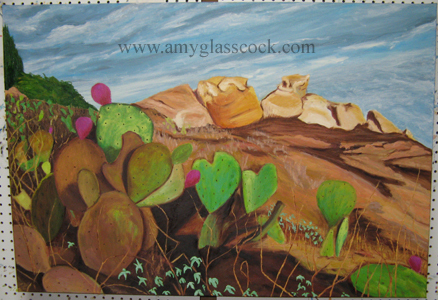 My next painting will be of Ink's Lake State Park (TX). I just finished building the stretcher for the canvas. 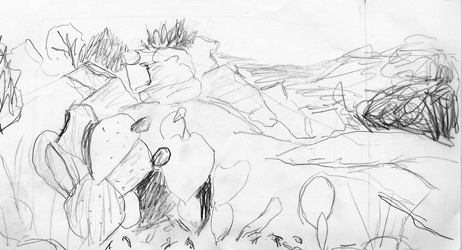 Here's a quick sketch of the layout. Stay tuned to see my progress. 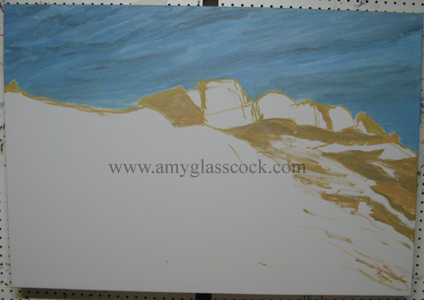 I started by sketching out where the rocks will go and I also started filling in the blue of the sky. I added some white to the sky today. 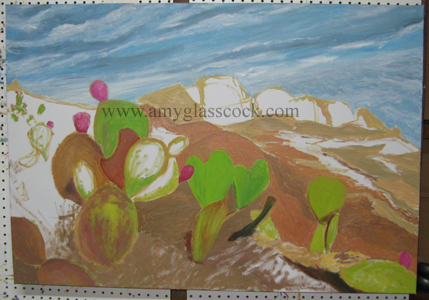 I added more greens, reds, and browns to the cacti today. I added more of the ground colors today. 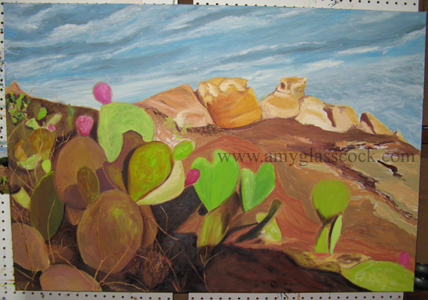 I filled in more dirt color and also started working on the rocks. Lots more to come- hopefully tomorrow...it's my b.day! 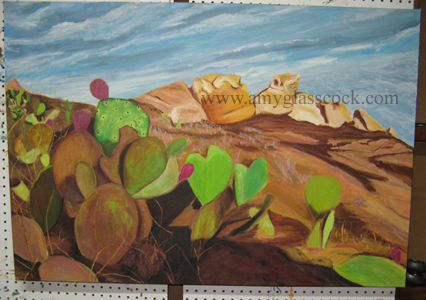 I'm excited because I worked on the shadows in the cacti... they are a purpley brown color... and that one piece looks like it is dimensional all of a sudden! Oh and it's my birthday! Yay! 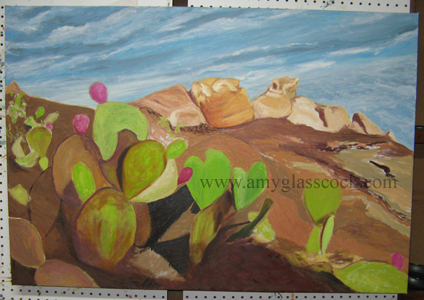 I added more contrast in the foreground by adding some dark purpley reddish browns and I also added some orange to the rocks in the background. 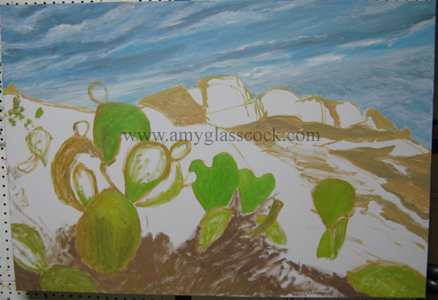 I also began including grass as you can see it on the left side. 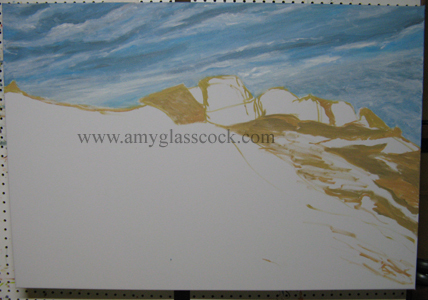 I am liking this one a lot so far! The grass reminds me of broken glass. 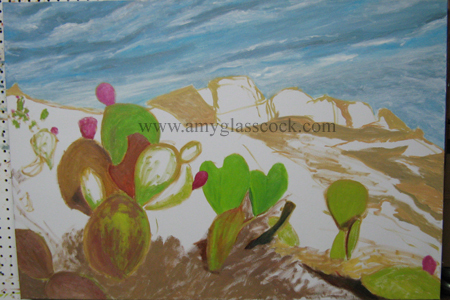 I also like how the cacti are beginning to act like windows that you peer in and out of. 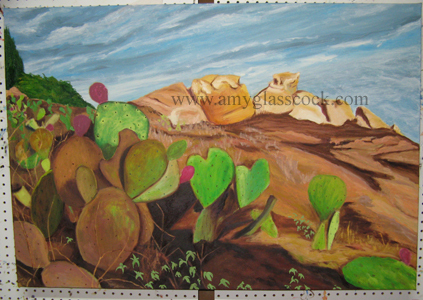 I worked on the land on the right side today. 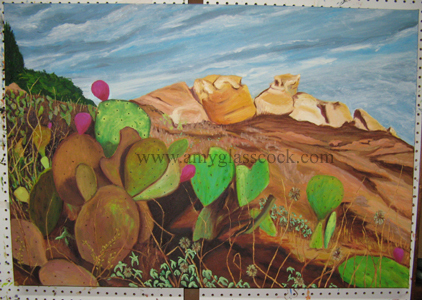 I also added some more dark brown to the rocks in the background to increase the contrast. 10.22.2008 > I forgot to take a photo. 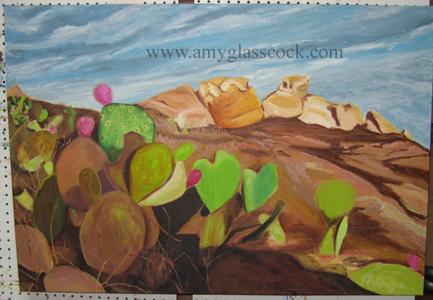 I worked on the cacti in the foreground today. I added some shadows and changed some of their colors. I started adding the green plants in the front and also I added some red outlines to the cacti to make the green pop. I added a lot more grass in the foreground and changed the color of the green plants in the foreground to a more muted light blue green color. I also added some grass to the left side in the back as well. I added little round plant dealy's at the bottom today. 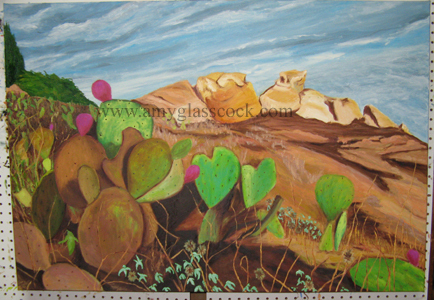 I also added more green grass to the left side. I'm trying to finish before Nov. 1st... not sure if I'm gonna make it! 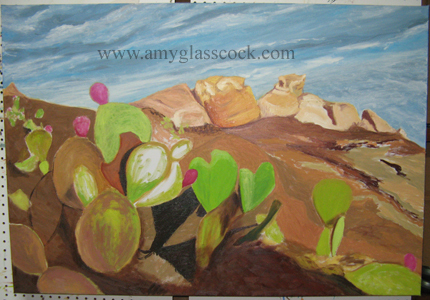 I added more little green leaves in the foreground and I also made the pink cacti bloom thing on the top a bit smaller at the base. 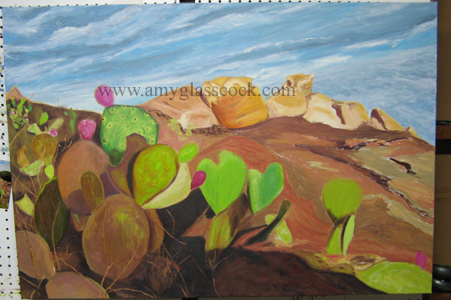 I worked on the right side and added some orange and light brown to the dirt and rocks. 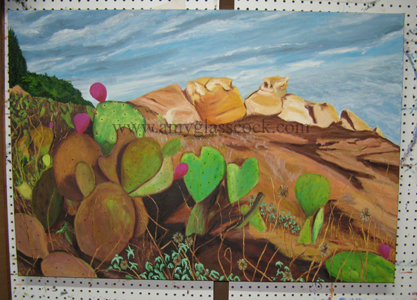 I worked on the left background today. 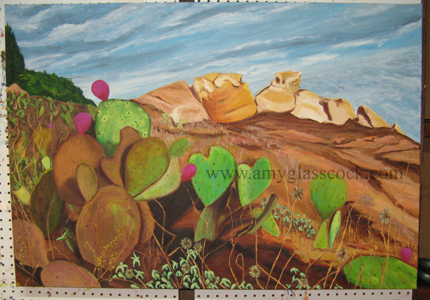 I added more contrast and I think that it really helped make the cacti in the foreground look closer to the viewer. A few more details to go and hopefully I will be finished tomorrow!